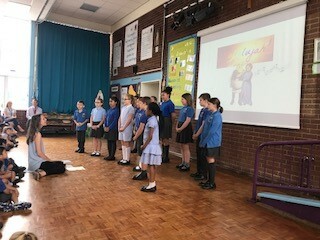 On Friday 20th July in the final assembly of the year we enjoyed dance performances from Reception and Year 5 along with a lovely performance from our choir and another look at the special PowerPoint Year 6 prepared for their Graduation. It was a lovely way to end the school year together and we wish all of the children from Year 6 all the best for the future! This entry was posted on Friday, July 20th, 2018 at 4:07 pm	and is filed under Catholic Life, Celebrating Faith. You can follow any responses to this entry through the RSS 2.0 feed. You can leave a response, or trackback from your own site.